Here in the Netherlands (and I believe in most parts of Europe), no vaccine is given for chickenpox. Which means it is a very common childhood disease here, and all parents know that at one point their child will come down with it. At least, they hope they do, because apparently getting chickenpox as an adult is seriously no fun! Ava still hadn’t had the chickenpox at the age of 3 ½, so when her little girl friend from across the street showed signs of the disease, I decided to let her go over for a playdate. As the virus is highly contagious, I deliberately exposed her to it, in the hope she would develop the disease and get it over with. (After having had the disease, you’re immune for the rest of your life). And sure thing — after an exact incubation period of two weeks, I discovered the first blisters on her back. Chickenpox is mostly completely unharmful, but it is a very uncomfortable disease. First there’s a fever and flu-like symptoms, and then hundreds of tiny blisters develop all over the head and body, and they itch! The whole thing usually takes no longer than a week, and thankfully Ava was her usually happy self just before Christmas. But then of course, again exactly two weeks later, Casper got it too! He was suffering for a week as well, and the worst part were the blisters on his nappy area — the poor boy. But now, after a month of dealing with the chickenpox, I am proud to say that our entire family is chickenpox immune. Did your kids get a vaccine against chickenpox? Or did they get over it the natural way? (Or maybe they still need to get it?) Would you deliberately expose them like I did? I’m curious to find out! 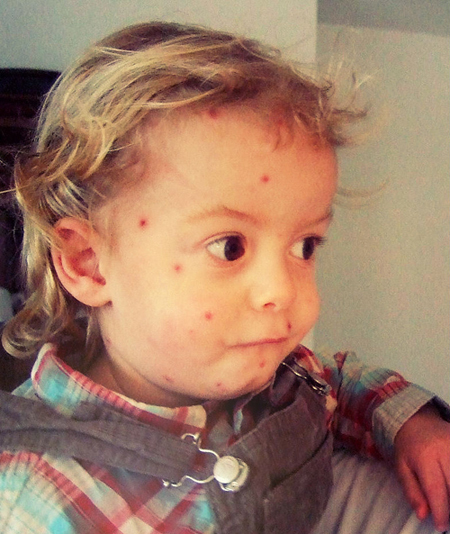 PS The photo is of Pim as a baby, just after he had the chickenpox at age one. Casper’s age! in Germany you can have vaccine if you like. After some consideration I chose to do so for both of my boys. I had them as a child and didn’t find them particularly bad. Guess I was lucky and the two-week homestay instead of school might blur my memory… But as you mentioned getting them as an adult is no fun. And for now I’m quite happy there’s One disease less to deal with. Wat een snoepje…ook met waterpokken!!! Hi! In Australia kids are vaccinated against it as babies, toddlers and preschoolers as a part of the immunisation schedule and cases of chicken pox are very rare in children now! My son is 5 and none of the children he mixes with both at home and pre-school have ever had it. I work as a teacher and it is very rare for a child to miss school because of chicken pox! I debated about the chickenpox vaccine. it is common in my native USA, but not in the UK where my boys were born. When my boys were 4 and 2 I decided to get vaccinated as they hadn’t gotten it yet and we moved to a country that did vaccinate (UAE) so I didn’t think there were going to be too many “chickenpox parties” to expose them at a young age and I didn’t want them to get as an adult. The clincher for me in the end was when I learned that if you have chickenpox you can possibly get shingles as an adult. My grandma had that a few years back and was absolutely miserable. As my boys have had the chickenpox vaccine they shouldn’t get shingles as an adult . . . but I don’t blame you for exposing Ava at the neighbours! I almost did that in London but it was right before we were going to travel and I didn’t want a sick kid on the plane!!! Hi Esther. I’m a french mum living in Paris. i hâve been enjoying the Life in Australia bringing up my two boys there. I’m an America mom living in Amsterdam. I was thrilled to learn that chicken pox still existed naturally here. I exposed my kids when they were 1 & 3. The timing was convenient because my kids were both healthy and we didn’t have any travel planned. I believe in the benefits of lifelong immunity. How nice to know your whole family is Chickenpox-immune now! I remember getting it as a child and it was the worst! I was around 10 I think and it lasted an entire two weeks! In Portugal it is also part of the immunisation schedule ( my son is 10 and it was vaccinated) and today is rare to find cases of chicken pox amongst children. But 40 years ago, when I was a child, I do remember having this disease and it was no fun at all. Fortunately you are now over with that in your family too! Hi agree Courtney. You would hardly see a case of chicken pox here in Australia. I still believe in the old adage, prevention is better than cure. I had chicken pox as a child before it was brought in on the schedule and still have the scars on my head to prove it. They were shocking. Glad my kids have been immunized against it. Hate to tell you Esther but there have been cases of kids who get it twice. Chickenpox is a hard topic, cause you’ll always found good and bad opinion in both hand. Having the choice to give or not is the point. And asking more Than one peadetrician is probably the best answer. Cause the vaccination is not the clue for every diseases. It won’t stop it ( you get it but not so baddly). But also vaccination can save Life! …for me it dépend of so many case : family situation ( new born baby at home) family histories, country philosophie ( building immunity with small diseases or avoing child diseases ). Thanks to Sofia for giving information about Portugal!! My family got a holiday house in Portugal and i didn’t knew this case. Good Morning, Esther: When my girls were small (25+ years ago), there was no vaccine in Canada. I, too, deliberately exposed my oldest child to chickenpox but it never worked. When she was 6, she developed the disease — twice. Apparently, while unusual, it is possible as the first time the full-fledged boils did not occur. The second daughter developed it within the two-week contagion period and the youngest exactly two weeks after that. They were infected during one of the hottest weeks of June. I had volunteered to be with my oldest daughter that weekend at Girl Guide camp; however, my husband was more than willing to take care of a 14-month-old who was covered, literally, head to toe in spots. He bathed them with baking soda in the bath water and used Calamine Lotion salve on the spots. The baby never even attempted to scratch because I suspect she didn’t yet realize what an itch was. Now that my husband and I are seniors, we have received the vaccine for shingles as it is now understood that shingles is chicken-pox in adult form. For those who never developed chicken-pox in their lifetime, there is also an adult vaccine available since it is an extremely painful, dangerous adult disease. Why would you expose your children to a disease? What a strange idea. The ultimate aim of the chickenpox vaccine is to eliminate it – thus reducing the horrible impact on the very young, the pregnant, the immuno-suppressed and the elderly. With every case you encourage, you damage those efforts. It may not be a big deal to you, but it has a big impact on the developing world. We had chickenpox go through our nursery in london and two children were hospitalised – one who ended up in intensive care with chickenpox on his eyeballs and lungs, which I didn’t realise was even possible. Chickenpox parties are dangerous. I do think it’s worth reminding people that chicken pox although a harmless childhood disease for most, can actually be life threatening for some, particularly the immune suppressed and of course can cause serious complications for pregnant women. I have been very surprised in the past when friends have been happy to take their children out and about whilst contagious, to the supermarket etc. There seems to be a serious gap in awareness about chicken pox and the devastating affect it can have on some people. That said, it is nice to get it over and done with when children are little. I wouldn’t expose a child deliberately, but when vaccinations aren’t available it’s certainly preferable to get it whilst young. It is possible to get it more than once though, although relatively rare. We always used to have chicken pox parties when I was younger, and I haven’t been shy in exposing my kids to chicken pox although they haven’t had it yet. One of my friends has a little boy (and my dad had this too) who has had ‘chicken pox’ three times now, although I believe after the first case it is really shingles you are getting, not chicken pox, so I’m not going to get too excited if they do get it! I think you have to do what you judge to be the right thing as a parent, from my point of view, chicken pox is more dangerous the older the child gets (or so my doctor has advised) as it can affect fertility etc, which is pretty scary stuff, so I would hope mine get it earlier, and if I could I would vaccinate. I live in Northern England, so like Courtney said, we don’t we get the option to vaccinate! My daughter is 4 and has not had chicken pox yet but i am about to get her immunised here in London because I suffer from auto immune diseases and so the chances are very high that she will have a very unpleasant and highly scarring experience were she to get it. If this is something I could prevent for her I definitely will. However I’m afraid I’m not a fan of deliberately exposing kids to the disease because you just never know what their reaction to it will be and I couldn’t stand the responsibility of knowing that I forced the situation. Of course having vaccination it is an ammazing chance . But being vaccinated does’t make you 100% safe even i bélieve on it. There’s no vaccine for chickenpox in Spain, or there wasn’t when I was a kid (I’m almost 22 now), I had chickenpox when I was six, ten days after my 3 year old brother had it. Living in the same house it was quite difficult to avoid, but I think my mom also thought that exposing me was a great idea to be immune, and I agree it is, cause I have two friends who never had chickenpox as kids and they got it in their twenties and was the worst! One even needed to be hospitalized! Whilst I throughly agree with vaccinations and have had both of my daughters here in Switzerland vaccinated to the local standard, I do not agree with the chickenpox vaccination. Our bodies are designed to fight and learn from infection and if we simply give it the easy option every time you will end up with a weaker immune system. The vaccine is generally only offered to children with other conditions here that could end up with complications from the disease. At some nurseries I have even known a no exclusion policy when a child has symptoms. Where I live, the chickenpox vaccine is part of the immunization schedule and my kids pediatrician highly recommended it. It seems that although chickenpox is unharmful, the chickenpox virus is never eliminated from your body and you may develop zona (shingles or herpes zoster) later in life since, which may cause excruciating pains. I got chickenpox as a kid and got shingles decades later just after my second baby was born; I was lucky it didn’t get to my optic nerve and was given antiviral medicine (compatible with breastfeeding) once diagnosed. There is even a shingles vaccine for adults now. In Argentina children are usually vaccinated against chicken pox….so I vaccinated my boy, but he had chickenpox nonetheless (a milder version I guess). Anyway, as someone pointed already pointed out, having had chickenpox can give you singles as an adult so I would probably not expose my kids on purpose to the disease. This is so interesting!! I remember having chickenpox as a child (I was about 5). My mom called all the parents of my friends and said she’d keep me in our yard, but they came over anyway, so we all had it together. It was before starting kindergarten, and I am guessing all the moms didn’t want to deal with it during the school year….classrooms being the Petri dish they are, chances are we would pick it up there if not before. But now in the US, it is a standard vaccine that children receive around age 1. So when we traveled to the Netherlands and my cousin’s child met us at the airport with chickenpox it was a bit of a shock! I can say the vaccine worked….my daughter didn’t contract chickenpox and I am glad because the itching can be excruciating at times as I recall. Glad you are all over it in your household! I think if the risk of harm was relatively small and you figured your child was going to get it at some point, I would do what you did and deliberately expose the child. My two girls went to nursery from a young age and were exposed to lots of illnesses. Chickenpox was one of the infections that went around regularly but they still not get it until they were about 2.5/3. While I vaccinated them against the more serious illnesses measles etc I did not against chickenpox, as I believed that there are no major long term complications 🙁 However, my eldest suffers from a high frequency hearing loss which can be the result of chickenpox!! There are worse things in life, but it does have an impact on her learning. She finds it difficult to distinguish sounds, for example she cannot differentiate between thirty and thirteen. Also, I believe, as she cannot hear properly it has an impact on her spelling. I think if I’d known before I’d had them vaccinated to avoid chickenpox altogether. i got child pox as a child, we have to be careful because my husband has not had chicken pox and has not been vaccinated, my son got chicken pox three times from the age of 21/2 , the first time while I was pregnant with twins. I then had my twins premature at 25 weeks – we believe they got the virus. The twins are healthy but then got chicken pox just before I gave birth to my fourth child a the age of 7. My fourth has not had chicken pox and so far neither has my fifth, but these last two have been vaccinated for chicken pox as we are in Australia. I have found that here if you have chicken pox you have to keep you children at home and away from schools and pregnant women and people generally look at the child and keep away. It was very interesting to read your point of view from that end of the world. Truthfully, I am perplexed by this idea. My five year old daughter has not been vaccinated against chicken pox, though it is standard here in USA. I am not sure then how she will contract the pox. I wish I could have come over when your children were contagious! I had my first born in London where he was not vaccinated, he came down with chickenpox at age 2, the night I went into labour with my second son!! And I had to stay in a hotel for 4 days after delivery to not expose the newborn to chickenpox. It was awful for my oldest and not at all the experience I had imagined bringing home his little brother, I was petrified the baby would get sick. We were even hiding the baby from his older brother!! People kept telling me he would be protected by my antibodies through breast milk (I had chickenpox as a baby). And luckily the baby did not get it! We now live in the US and in order for kids to go to school and preschool they need to have the vaccine. both my second son and my daughter, born here got the vaccine. Part of me wanted all my children to have had chickenpox as I believe it is the safest way of not getting it as an adult, but I am also happy my 2 youngest are vaccinated and will not have to go through with the awful blisters and scratching. If they do catch chickenpox with the vaccine at least it is very mild version. But who knows for sure either way. It’s tricky! My son was born in France, never got vaccinated there for it. I decided that now in the US, that we would vaccinate him. Why? My past boyfriend had never gotten vaccinated, and never had Chickenpox. He finally got the disease in his 20’s…and it was a total nightmare! He had it in his ears, nose, mouth, groin, and even eyelids! He had to wear gloves, and was in complete utter agony for weeks. He suffered much scarring as a result. Also, the vaccine will help against Shingles. Once one gets Chickenpox, Shingles is possible when adult. My mother and aunt both had Shingles. Open blisters, pain and scarring. I thought about my child’s future health, not just his childhood. This is a tricky one. i’m not in favor of vaccinating, as it doesn’t completely protect you anyway. On the other hand I’m concerned about how lightly people treat this disease! My baby girl nearly died of chickenpox. She was 9 months old, perfectly healthy and on breastmilk. Her big brother brought it home, the chickenpox, and I wasn’t concerned at all – I’m Dutch like Esther and we are brought up to believe chickenpox is common like a cold, but with fever and itchy spots, everyone will get it some day. However, for my little girl it turned out to be something serious. The chickenpox turned inwards and she had to be hospitalised for almost 2 weeks and nearly died from it. It would be good, I think, to never think lightly about these diseases. Hi Esther, I live in Australia, where our kids must be immunised at regular intervals for mumps, measles & rubella (chicken pox) until the age of 5 in order to go to childcare, preschool & then school. Just curious do you know why the rubella vaccine isn’t available in The Netherlands? I had the rubella as a child along with my 4 siblings in the middle of summer because there was no vaccine when I was a child. Oh how I can still remember how miserable we all were & one of my sisters still has facials cars from scratching the sores. My husband recently had shingles as well because of no immunisation when he was a kid. So I am glad my kids don’t have to worry about that childhood illness. Oops, thanks Mary, I did get that mixed up, chicken pox is Varicella, which we do get a vaccine for at 18 mths here (just looked it up on the health dept website & my kids’ immunisation records). Thanks for clearing that up. I’m afraid there is one thing I don’t agree with you that we have a choice about vaccinating or not, we don’t otherwise our kids can’t go to childcare or school. To be honest I am pro-vaccination I think those who are anti-vaccination are mis-informed about the impact of vacination our children’s health. At first, you can vaccinate your children against chicken pox in the Netherlands, it’s only not (yet) part of the national immunization program so you would have to pay for it yourself. I just spoke with my Dutch pediatrician about this. She really would like it to be part of the immunization program and she thinks in the near future it will. She also def not recommended going to so called ‘chicken pox parties’ and then bring your child knowingly to day care or school where there are a lot of very young children or pregnant mamma’s around for whom chicken pox could be potentially very dangerous. In the hospital she told me they just had a chicken pox case with a child that came in for something else and then had to close the area in the hospital and inform all parents of little children and pregnant ladies who were there and monitoring them during incubation period. This was in a Dutch hospital so I do think they take pretty seriously in Holland too. I live in Seattle, WA and the vaccine is required for child care and elementary school. I chose to vaccinate by two boys and don’t regret it one bit! As those mentioned above it can be mild in some children and life threatening in others and I didn’t want to take the risk or expose others to chickenpox whose immune systems were suppressed, or who were too young to get the vaccine. As a side note, I had a natural case of chickenpox as a child b/c there was no vaccine for it in the 1970’s. And, unfortunately when I was 8 weeks post-partum with my 2nd child I came down with shingles and it was really uncomfortable and was very worrisome as I had to be really careful not to expose my infant to the disease! I say if the vaccine is available in your country than please choose to vaccinate your kids to protect your community. I live in Washington State and both of my children have been vaccinated for chicken pox and I wouldn’t have it any other way. I certainly don’t want to put them through being sick with this very uncomfortable sickness since I can prevent it. I had it as a child in the late 70’s and can remember being so icky and unhappy with the whole thing. I also have gotten shingles as an adult which is a by product of having chicken pox. The vaccination is a win win situation to me and for my family and for the community around us. Vaccinations end so much unnecessary suffering. Even though my mother used to send me to ‘chickenpox parties’ I didn’t get the disease until I was 16 years old, together with shingles. It wasn’t a pleasant experience and as a result my eye sight deteriorated as I got so many spots even under my eyelids!! Helena received her vaccination in South Africa but still caught a mild form of chickenpox when she was 3 when we visited her cousins in the Netherlands. Florence has just received her vaccine in the USA so fingers crossed we are all free of the disease now!! It’s really interesting reading all the above comments. I would say if the vaccine is able – take it. For a whole lot of reasons we chose not to vaccinate and because our children are homeschooled there has never been any need for vaccination certificates. They have actually had nearly all the childhood diseases: mumps, measles and so on… and so they now have a natural immunity. BUT: Oh how I hate chicken pox… as a mom of more than a handful of kids… I can say my first two got it with just a few blisters when one was 6 mo and the other was nearer 2yrs. And I thought , shew they are now immune for life… little did I know and about four years ago all of our kids got it, the older two again… but really mildly… And I thought SHEW now they are really immune… and last spring they all got it again – really really badly. Every two weeks another child got it… it took nearly four months to leave us… one after the other and it was terrible – they were spotted everywhere… in their ears, eyelids even and every nook and cranny… my teens suffered the worst… they were in a lot of discomfort… Now I hope they have a natural immunity because I never ever want to go through that again. and yet you’re still anti-vaccination? That is pretty confusing to me – could you explain why? Congrats on being chickenpox free family! Even if you are vaccinated you have a small chance of developing chicken pox or shingles. At any time in your life. In my opinion Each parent should weigh up for themselves what in their minds (if your country gives you that choice) what would do more harm, overdosing possibility as in too many vaccinations at a young age (only in the next 40-50 years we will know if will have had any health implications) or chose only for the more dangerous deaseases to be vaccinated against at a young age. I think it is personal decision and has no right or wrong choice. yeah it’s really nice to told about this blog, that who’s Person helps to suffering from Jaundice Problem…..
Did you realize that getting Chickenpox subjects one to getting the horrific Shingles skin disease when older? 2 members of my family that had ‘naturally’ gotten Chickenpox, had also gotten Shingles as adults. It is a more horrific debilitating skin disease that can often reoccur over and over again. The Chickenpox vaccine protects against future Shingles also! So to protect my child against future adulthood skin trauma, we have decided to get the vaccine here in the US. My son was born in France, and never received it. I am looking at his future, not just his childhood. By the way, my past boyfriend got Chickenpox as an adult, and it was horrific! He looked as though he had Lepresy, and was in pain for weeks. He had it in his mouth, nostrils and ears, as well as groin area. I took care of him for weeks, and he had bad scarring. I would not wish this to happen to anyone. I pray not to get Shingles myself, as I suffered Chickenpox also. Unfortunately not necessarily chicken pox immune, although reinfect ion is rare it is possible and of course once infected with chickenpox there is always a risk of shingles…but natural immunity much more effective than vaccination.